A suspect has been arrested for the killing of a Canadian schoolgirl following a breakthrough in a lengthy investigation into her death. 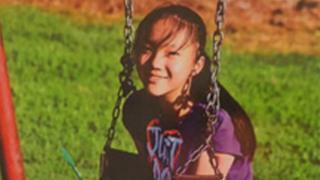 Ibrahim Ali, 28, a Canadian permanent resident, faces first degree murder charges for the killing of Marrisa Shen, 13. Her body was found in a park in Burnaby, British Columbia in July 2017, shortly after she was reported missing. Police said at the time that they believed the crime was a "random" act. Authorities say Mr Ali had no criminal record nor prior contact with police before he came to their attention about two weeks ago. They did not reveal what evidence led to his arrest over the weekend, saying only it was the "culmination of a number of things". They do not believe Mr Ali and Ms Shen knew each other. Mr Ali came to Canada as a Syrian refugee 17 months ago and was living in Burnaby, a community east of the city of Vancouver. His arrest marked the end of one of the largest investigations for the British Columbia's Integrated Homicide Investigation Team in its 15-year history. The Shen family released a statement on Monday, thanking the public for their support and for submitting hundreds of tips to police. "We hope that justice will now be served and that Marrisa can finally be at peace in heaven," they said. Homicide team Superintendent Donna Richardson said she hoped that there would be no backlash due to Mr Ali's status in Canada. "By and large, our refugees that come to the country are hard working citizens that are happy to be in Canada, and I would just hope that we look at this incident for what it is - a one-off situation," she said. Marissa Shen's body was found in a wooded area in a popular park not far from her home in the early morning hours of 19 July. The schoolgirl was last seen leaving a Tim Hortons restaurant and walking in the direction of the park. Her family reported her missing about four hours later. Police have released few details about the circumstances of her death. The suspect is due to appear in court on 14 September.